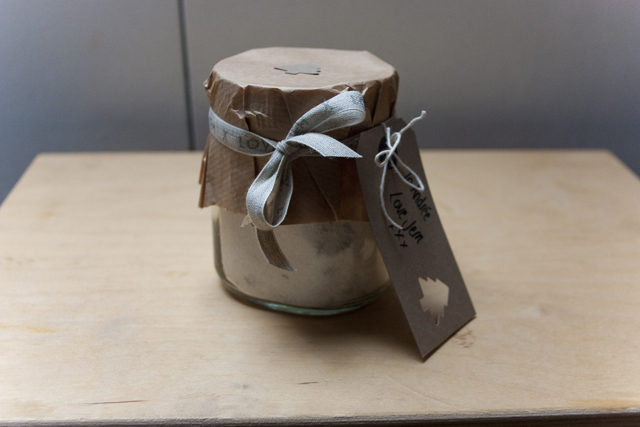 Flicking through Christmas pictures to beat the January blues might seem like an odd sort of cure but I found a handful I thought I would share - a handmade present to my boyfriend's Mum - some organic dead sea bath salts scented with Rose and Lavender. If you recognise the shape of the jar then you're a fellow Nutella lover and I'll level with you; sometimes I enjoy a teaspoonful or three straight from the jar. 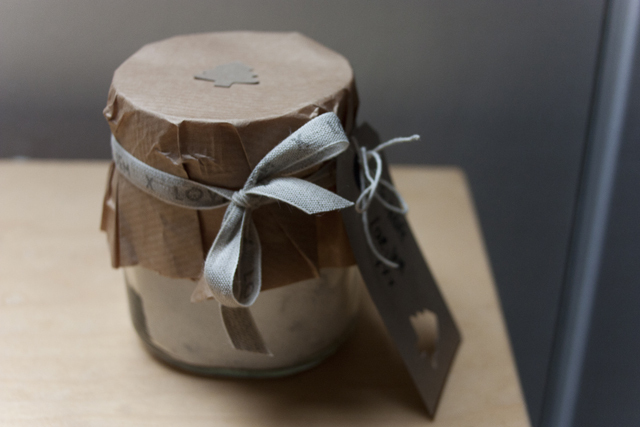 I once read somewhere that how you package a homemade gift is almost as important as what you make and I've tried making my own giftboxes, printing my own wrapping paper but with this jar of joy I kept things very simple. The little luxury was some printed linen ribbon I was very kindly sent by Lyn Abraham of Squeak Gift and Party who sell handmade gifts, decor and trimming in the heart of the Peak District and not 15 minutes from my front door. 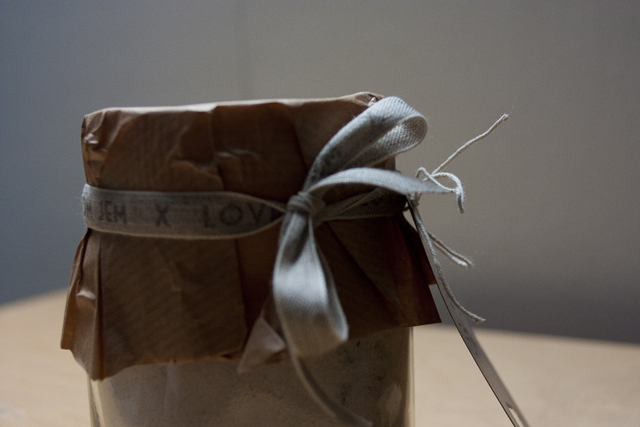 There's something lovely about discovering a brilliant local shop, seller or crafter. I frequent the local market every week and feel very lucky that Ashbourne, the market town I'm based in, is full of gorgeous independent shops so shopping local is something of a joy rather than a fraught effort. I've been inspired recently by how many people I have seen making successes of small businesses . . . . . About time I revamped my own little Etsy shop after a long period of neglect. Watch this space! I recently made lotion bars...it's such joy making them and as you said boxing or wrapping them!! Lovely! I have some soap making ingredients and can't wait to get started. Bet that smells gorgeous, I love rose and lavender. I always enjoy a high street with independent shops, was only thinking the other day how utterly depressing Croydon is looking - samey, shops going out of business left right and centre (seems to be a new company in trouble in the news every week) and 'we buy gold' and 99p shops taking over instead. goreous present, the printed ribbon is the perfect finishing touch. But then, I feel very privledged to know you have much aceness in the wrapping present skills...I always look forward to a Jem shaped present as I get as excited about the wrapping as I do the contents!! Yey can't wait to see how you get on with your etsy store - I love an online browse myself on a cold winter day. That ribbon is adorable and really finishes off the item perfectly! That is just gorgeous! 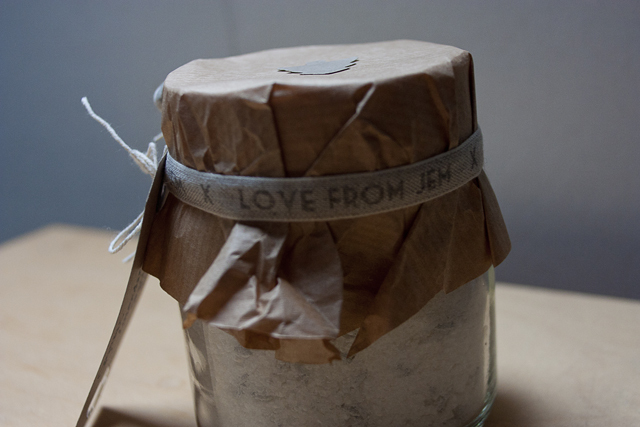 love detailing and finishing touches or novelty to a present, they are THE BEST presents ever! Wow! Love your blog! I love your photos...so beautiful. Thanks! What an absolutely beautiful gift, you're so creative & the ribbon is the most perfect finishing touch! I too am feeling very inspired seeing people's small businesses take off. This year I really want to get my print shop up and running finally. It's my absolute dream to spend my days taking pretty photographs. I just need to figure out where to start! I'm very much looking forward to seeing your etsy shop back up and running, you always had the most amazing pieces listed and I definitely want to buy something pretty for mine and my boyfriends home! We have a huge side table with lots of compartments ready to fill with pretty things but we're lacking on the pretty thing front! We always have the best intentions to visit car boot sales but he pretty much always ends up working every Sunday so we never get to go! I also have no idea where the best charity shops are. I bet there are some lovely ones over your way & I wonder if there are any in bakewell worth a visit?